Thought you knew your ice cream from your gelato? Think again. Whether it’s a cone or a cup of the good stuff you’re after, we’ve got the low down on each ice cream parlour or gelateria in Brighton and Hove’s USPs to make sure your every craving is covered. Handily situated just minutes from the beach, new experimental soft serve ice cream shop Soft Republick champions the creativity of its customers and locals, with its wall art created by Brighton-based graffiti artist Pinky. With two floors of quirky seating and colourful decor, there’s more than enough space for seating, plus an upstairs space for creatives and dynamic in-store events. 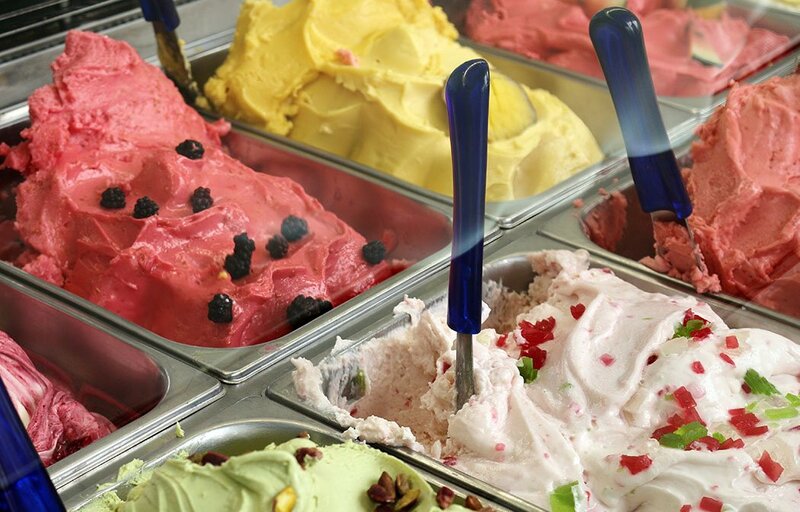 Ice cream can be sprayed with naturally coloured flavourings graffiti-style, doused in pretzels, chilli flakes and popping candy, or served in a choux bun, as part of a takeaway box of treats, or in an espresso sundae – and it won’t cost the earth, with prices starting at £2. A vibrant cafe specialising in ice cream sundaes, waffles, hot dogs and Scandinavian groceries, East Street’s Scoop and Crumb offers the largest ice cream sundae menu in the UK with more than 55 flavours, each one served in traditional sundae glassware – the way it should be done. There’s a huge floorspace of relaxed retro seating for a spot out of the sun too, if you’re feeling the heat. Since it was established in 2007, Scoop and Crumb has been featured in the national press, on TV and won national awards for the last three years running – and no wonder!Average prices range from£3 – £7. BN1 recommends: Get yourself a sundae. You won’t regret it! Serving artisanal gelato and sorbets, made freshly every day in store, La Mucca Nera is an authentic Italian gelateria; here’s where the good stuff is made, with staff personally sourcing ingredients from Sicily. Pastries, cake, coffee and wine are also available to purchase alongside the gelato, and the parlour also offers a generous cocktail list including espresso martinis and ‘the best Aperol Spritz in town’. Located in the heart of Kemptown, about a five-minute walk from the Old Steine (so nice and central), La Mucca Nera is open late to satisfy those late-night sugar cravings (or urge for a cheeky cocktail). Prices range from £2.70 for one scoop to £17 for a one litre tub, so get digging! BN1 recommends: Try the Stracciatella, or the affogato. Return visits are a must! Micro factory and shop Boho Gelato serves handmade Italian ice cream and vegan sorbets seven days a week. Its 24 flavours change regularly and range from vanilla to cherry, and mojito to pink lemonade. Boasting two sites in Brighton and one in Worthing, Boho proves its popularity in numbers – yet hasn’t marked up their prices as a result (average between £2-4). Quick tip? The Pool Valley store is ALWAYS quieter. All-organic ice cream parlour with brass decor. No plastic spoons here! Prices from £3.25. BN1 recommends: Go against your gut – the ice cream here is sublime, and the flavour payoff is huge!